Option Range, one of the top trading platforms for binary options, has increased its binary assets for the weekends. Monthly binary assets too will get a boost. This move was made by the trading platform as it recognized the fact that its investors wanted options for trading even when markets are not open. Investors looking for a platform that allows them to trade at their convenience will sign up with the company. Some of the assets that can be traded in, on a long and short term at Option Range, are stocks, indices and commodities. This wide range of options indicates that the company is committed to catering to the requirements of different traders. Two weekend and monthly options that traders will have access to are commodities of crude and gold, and Standard & Poor Futures. Apple and Google stock options are being offered exclusively for monthly trading. In addition to these, forex pairs are offered for both terms. Traders will have access to all the pairs except for that for New Zealand. The company was launched in 2011 and has since had a large customer base. One of the reasons for this is its wide range of binary options. They are offered in three categories at the company – range binary, touch binary and digital binary. All three have a number of takers at Option Range. 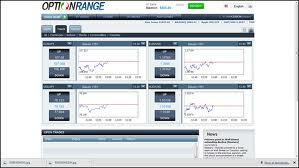 Option Range has a demo account, which will be beneficial for investors who are new binary options. Through this, they can learn to trade binary options. The demo account comes with virtual money amounting to £500. This can be used when trading with the account. Once investors are familiar with the account, they can use the real money account. Just as this encourages investors to trade with Binary Options, so does its low minimum deposit requirement of £50. The company also has trading tools called ‘Extend’, ‘Stop Loss’ and ‘Take Profit’. With Extend, traders get to lengthen the time for which the binary option stays open. Stop Loss and Take Profit are tools that allow them to sell options before expiration, to reduce potential loss and ensure profitability is retained.